If you live in the Northeast, I am so, so sorry. I can’t even believe the snow they are getting! It’s totally out of control. If you’re up there, you may just want to skip the next few lines. Sorry. It’s been warming up here, getting into the 70’s most days this week. I’m a little nervous about what that means for this summer… but… for now, I’ll take it. Since the weather has gotten warmer, our winter greens have been flourishing. Our lettuces and kales are going crazy, and we’ve been trying to eat lots of salads to keep up. Salads can definitely get boring if you don’t do them right. But they can also be amazing if you do. I used some of our butter lettuce to make my Taco Salad at the beginning of the week. It’s one of my favorite easy recipes but I hadn’t made it forever! After I thinned the butter lettuce, the kale was next. I consulted Pinterest and found this delicious looking Chopped Thai Salad from The Wicked Noodle. We love Thai flavors, so I was sold! I added some shrimp to bulk it up a bit, which was an awesome addition. To make the dressing: In a blender, combine coconut milk, peanut butter, 1 tbsp curry powder, garlic, lime juice and sriracha. Blend until smooth. Pour dressing into a small saute pan. Bring to a boil over medium-high heat, then reduce heat and simmer 10 minutes until slightly thickened. Remove from heat to cool. Meanwhile, heat the olive oil in a large skillet over medium high heat. Add the shrimp and 1 tsp curry powder and saute, tossing to coat evenly, until shrimp is cooked through, about 5 minutes. Set aside to cool. Toss remaining ingredients in a large bowl. Top with shrimp, then serve with dressing. This dressing was amazing. It definitely makes more than you need for the salad, but that’s a good thing. Save it and pour it on everything. Roasted veggies, potatoes, chicken. Trust me, you’re going to want to bathe in it. I loved all the flavors in this salad– sweet, savory, crunchy. And look how colorful it is. That’s how you know it’s super duper nutrient packed and good for you. Eat the rainbow. We’ll definitely be making this one again. You may also want to check out these other Thai-inspired salads from some of my favorite bloggers! I’m so jealous that it’s in the 70s by you, Jess! It’s in the single digits by me today. But this shrimp salad would definitely make me forget about those winter blahs. It sounds amazing! I love the fresh veggies and pretty pops of color! Let’s just say…. I’m going to freeze in Utah. LOL! We just got another big snowstorm and I am dreaming of warmer temps. 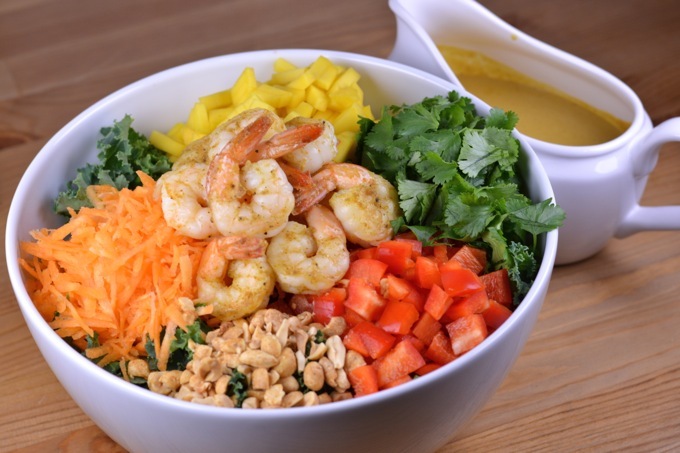 This colorful shrimp salad is perfect to bring some sunshine my way 🙂 I love the Thai flavors and all those fresh veggies. Looks delicious! Temperatures in the seventies sound amazing. We typically don’t have bad winters in South Carolina but we are currently in the midst of some wicked cold weather. I tropical salad sounds like just what the doctor ordered. I got excited when I read “thai shrimp” and even more so when I saw “coconut curry dressing”. That sounds amazing! Thanks, Christin! The dressing really makes the salad– it’s SOOOO good! I’m enjoying our warm weather here in the SF Bay Area for sure! I do hope it rains more soon however. 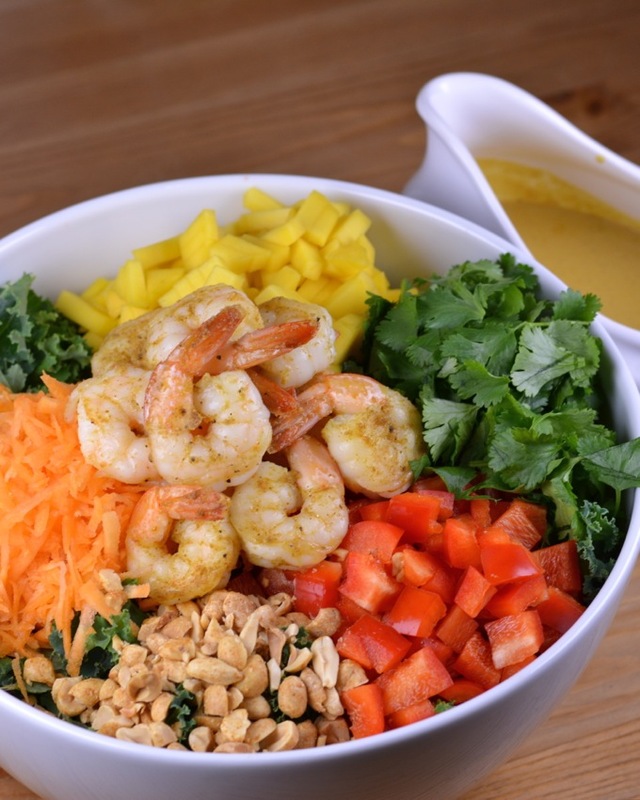 🙂 This salad looks delicious and I love all of these Thai flavors! Pinned! Yeah, we could use some rain… but I’m not holding my breath… unfortunately! Thanks, Marcie! I’ve been loving our warm weather and sunshine the past few days! This salad looks so fresh and healthy! I love that you added shrimp for some protein. Pinning! I need this gorgeous salad in my life STAT! All those colors are enough to brighten my mood! Jess even though I don’t like shrimp, this salad looks so delicious!! I am so tempted to try this without shrimp ! Yumm! It would be awesome even without shrimp! You could add grilled chicken instead… or honestly even just eat it as is!! What a fabulous salad. It looks so good. We are so spoiled here in California. We had a gorgeous 75 degree and sunny weekend. We went wine tasting, and I was in a t shirt all day. The best! This salad sounds AMAZING! Can’t wait to make your coconut curry dressing. Yum!